Jerry Jeff Walker used to say that he doesn’t live in Texas, he lives in Austin. The opposite can be said of the Broken Spoke, where true honky-tonk Texas lives in the heart of nouveau hip Austin. The Spoke used to be a roadhouse on the outskirts of town, but now it’s surrounded by the bustle of South Lamar Boulevard, including trendy new condos that rise on two sides of the low-slung dancehall. When you step inside the rustic red building, though, it’s still 1964, the band is playing “Walking the Floor Over You,” and the dance floor is a counter-clockwise swirl of bodies. “We’ve never changed a thing,” says James White, who has run the Spoke with his wife Annetta for two-thirds of his 75 years. “When you come to the Broken Spoke, you’re coming to the same place that folks have been coming to for 50 years.” November 5-8, the 661-capacity dancehall with the big oak tree out front and “the best chicken-fried steak in town” is celebrating its landmark golden anniversary with a week of classic country dancing and honky-tonk bands. Dale Watson is so attuned to what the Spoke crowd wants that he named a Texas two-step “Quick Quick Slow Slow” as a template for new dancers, who share the floor with expert twirlers. As for non-dancers, they quickly learn to respect the number one Spoke rule: no standing on the dance floor. Terri’s goal is to get her students on the polished-concrete dance floor that night when the band’s playing. “Last year we had 40 Korean men, and their translator didn’t show up,” laughs Terri. “And we still had them two-stepping that night.” It’s a story she relates to new classes that don’t seem to be getting it. In 1964, Austin native James White was a 25-year-old just out of the Army when he discovered a vacant property with beautiful oak trees at 3201 South Lamar. He put the money together to build a beer joint and restaurant, and dreamed up a memorable name. That first year, the Broken Spoke consisted of only the front room, which is now the restaurant. A big fan of country music, James White and friends added the dancehall the next year. The roof leaked for 25 years and the ceiling is too low for some musicians to wear their cowboy hats onstage. Most of the tables are quartered sheets of plywood supported by two-by-fours cut at an angle. And the chairs are cheap metal fold-ups. “I worked 16 hours a day at the bar in the beginning,” says White. 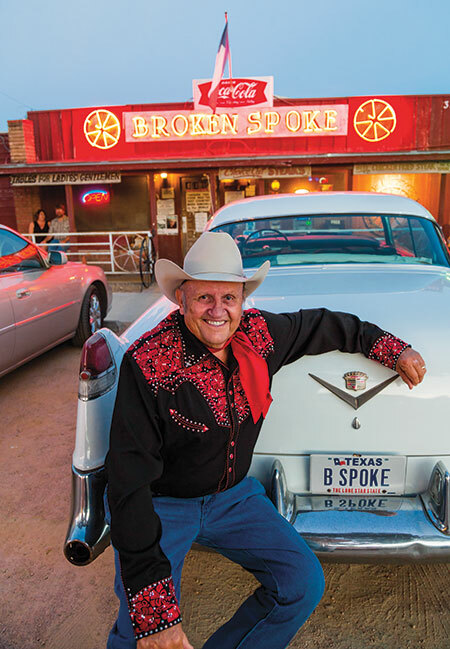 “And I was in charge of booking the bands.” The Broken Spoke remains a family endeavor. The Whites’ youngest daughter, Ginny, helps coordinate the business, including employees and the restaurant. “It’s a true mom-and-pop operation,” White says. Other country greats who’ve played the Spoke include Roy Acuff, Tex Ritter, Ernest Tubb, Kitty Wells, and, of course, Willie Nelson, who was a clean-cut Nashville artist when he first played here in 1967. The newer bands that play the Spoke, such as the Derailers and Mike and the Moonpies, play all the old songs, as if country music never experienced Urban Cowboy. The 1980 hit movie starring John Travolta and Debra Winger spurred a country disco scene that continues to flourish in Texas and beyond—in complete opposition of the Broken Spoke model. There are older clubs in Austin, but the Broken Spoke is believed to be the oldest continuously operating music venue in town. “Cold beer, good food, and real country music is all we’ve ever advertised,” says White, who can be found most weekend nights greeting customers in the walkway between the restaurant and the dancehall. He also likes to wander his “Tourist Trap” room of memorabilia, pointing to an autographed photo of George Strait and telling impressed onlookers that “King George” played the Spoke once a month from 1975 to 1982, for about $500 a gig. The journey has not been without its bumps. When the Spoke raised the price of beer a nickel to 30 cents in the ’60s, there was outrage. Then, when selling liquor by the drink became legal in Texas in 1973, the Spoke opted to remain a beer joint because regulars threatened mutiny if they couldn’t continue to bring in their own bottles of hooch. The Spoke finally got its liquor license in 1980, one of the only changes in the venue’s 50-year history. And don’t expect the Whites to start changing the Broken Spoke now, even as Austin transforms around it. The Broken Spoke is at 2301 S. Lamar Blvd. 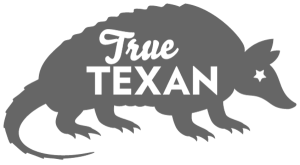 Call 512/442-6189.